Discussion in 'Pickups, Electronics & General Tech' started by patdavidmusic, Apr 13, 2018. They look like this. They are cheap cheap cheap. $0.30 a piece here in the US. I would contact Fishman to make sure you get the correct ones. They will sell them. They may send them for free. 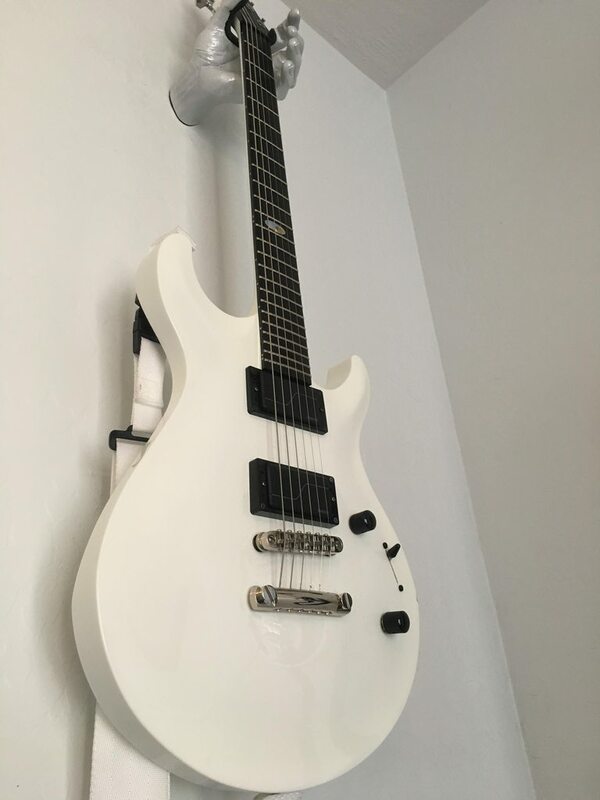 For what it’s worth I didn’t have the chance to swap the Alnico Modern to the bridge, but I did try swapping the Ceramic Modern for an EMG 57-8. The Fishman plug worked just fine. The 57-8 seemed similar to the Ceramic Modern Voice 2, but the EMG was a bit thinner and a bit more hairy or wooly. The Ceramic Modern was a bit thicker and smoother. I stuck the Fishman back in there, as I was much happier with it. Alright, tried the Modern Alnico 8 at the bridge position. It’s definitely lower output. It’s not driving the amp as hard. “Passive” mode sounds single-coil like with a snappy and twangy, somewhat hollow midrange “cluck,” which is very cool IMHO and explains why I liked it so much in the neck. “Active” mode is pretty mild. It’s comparable to the Ceramic’s passive mode in voicing and output IMHO. Compared to that, the Alnico is brighter in some ways but also a bit more “full”. Basically, it’s what I wanted the Ceramic “Passive” mode to sound like. Not as clinically smooth on top and not as surgically tight in the mids and lows. The catch is that if you liked the really hot and cutting “Active” Ceramic mode, the Alnico gets you nowhere close IMHO. That’s fine for me, but leaves me having now to buy another Alnico pickup I put an EMG 66-8 in there for now as a place holder, and that thing is nowhere near as sweet or dynamic as either Fluence mode. Flappydoodle, MerlinTKD and HairyNutsack69 like this. Do any of the 8-string open-core options (neck, bridge, Merrow) sound like the Modern Alnico? I've come to REALLY like the Alnico Modern 8 at both positions of my current 8-string. I have two more 8-strings that supposedly will be completed within the coming month or two, and both use passive-sized pickups. So the Modern 8 is a no-go, since I am definitely not routing these guitars for that pickup. The only ones with the open core aesthetic as of this writing are the classics and the Merrows. Both of them sound more similar to each other than they do to the modern. The closest is V1 of the Merrows having some similarities to V2 of the Modern Ceramic... but only a little. Most of their pickups are variations on the modern set. The Merrow is a variation on the classic set. Thanks. The good news is that the descriptions of the Open Cores are generally what I would like (essentially beefy PAF types). But there’s obviously some variables there. The EMG 57 supposedly is a beefed up PAF type thing and doesn’t sound nearly as good to me as the Modern Alnico. But the Duncan Custom (totally different, I know) also is billed as a beefy PAF and I love that one. Guess I’ll just have to try them all. Ugh. These new guitars are coming with either a set of Dimarzio PAF 8 or Duncan Sentient 8s (which I know are typically used at the neck, but I thought I’d try them at the bridge too). Hopefully they’ll work out fine, but I’m expecting to want more oomph out of them at this point. (Problem when guitars take this long to build. My amp changes and now all my pickups need to change). I absolutely love it. The active mode is exactly what I wanted from a humbucker: thick mid range, clear bass, and nice treble bite without extending too far high or low. Strobe and LeviathanKiller like this. I'm gonna switch my Alnico into the bridge of my Rgd 7421. Bridge is just too hot and too thin. And I love 81's. So I pull up and it's too fat and low output. If Emg made a passive size 81-7tw I'd buy it and kiss it's biscuits. Here is a quick high gain comparison between Fishman Fluence Modern 7 and Fishman Fluence Tosin Abasi 8 pickups. setsuna7, Flappydoodle, HeHasTheJazzHands and 1 other person like this. The EMG 81, Classics, and 57s sounded the best to me. Jari's own conclusion at 15:09 is winners were 57 and 81.
jesus he dialed in all the treble. every pickup sounds super clanky and djenty. I did like the low end thump of the 57 and classics though. LeviathanKiller and TheShreddinHand like this. jesus he dialed in all the treble. every pickup sounds super clanky and djenty. So much this...i couldn't even make it through the whole video. Overall tone was painful. This also isn't wrong. I was using laptop speakers at first and thought it sounded thin and harsh. I went grab my proper headphones and it made it sound even MORE thin and harsh. But yeah, I wouldn't use the Fluence Classics if your tone is already trebly like this. It's probably one of the brightest pickups I've ever used. I had to take it out of a bolt-on maple-necked guitar because it was getting too harsh and clanky. Ugggh he even managed to make the 57 sound thin. He said he doesn't like the "cardboard box" mids on the Modern. I think that's what makes the Modern sound a little less compressed than the 81. But yeah, the Modern could use some the 81's lows. Because it can sound all mids when you dont tune your amp to it. I wonder how the Modern V2 sounds compared to the 57. I only have the Hetfields to compare with and so far Modern V2 has all the bottom but manages to sound tighter. The Hets have a LOT of low mids. I want to try some more of these. Does anyone ever put these Fluences in Wolfgangs/HPs? Might look goofy but sound great. I have an EVH import Stealth I'm looking at, also a newer HP2. Also have an Epi LP7 Goth that is a contender for a swap. Might consider a Classic set or modern (?) I dig the KSE but want to mix it up on other guitars. Jari's detailed review on fb. Too long to quote here.